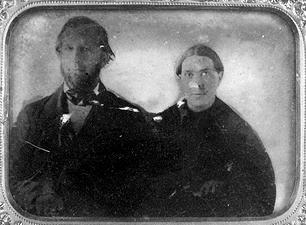 Earliest photograph of James and Ellen White, made in 1854.—White Estate. August 30, 1846, I was united in marriage to Elder James White. Elder White had enjoyed a deep experience in the advent movement, and his labors in proclaiming the truth had been blessed of God. Our hearts were united in the great work, and together we traveled and labored for the salvation of souls. We entered upon our work penniless, with few friends, and broken in health. My husband had inherited a powerful constitution, but his health had been seriously impaired by close application to study at school, and in lecturing. I had suffered ill-health from a child, as I have related. In this condition, without means, with very few who sympathized with us in our views, without a paper, and without books, we entered upon our work. We had no houses of worship at that time. And the idea of using a tent had not then occurred to us. Most of our meetings were held in private houses. Our congregations were small. It was seldom that any came into our meetings excepting Adventists, unless they were attracted by curiosity to hear a woman speak. At first I moved out timidly in the work of public speaking. If I had confidence, it was given me by the Holy Spirit. If I spoke with freedom and power, it was given me of God. Our meetings were usually conducted in such a manner that both of us took part. My husband would give a doctrinal discourse, then I would follow with an exhortation of considerable length, melting my way into the feelings of the congregation. Thus my husband sowed and I watered the seed of truth, and God did give the increase. In the autumn of 1846 we began to observe the Bible Sabbath, and to teach and defend it. My attention was first called to the Sabbath while I was on a visit to New Bedford, Massachusetts, earlier in the same year. I there became acquainted with Elder Joseph Bates, who had early embraced the advent faith, and was an active laborer in the cause. Elder B. was keeping the Sabbath, and urged its importance. I did not feel its importance, and thought that Elder B. erred in dwelling upon the fourth commandment more than upon the other nine. But the Lord gave me a view of the heavenly sanctuary. The temple of God was opened in heaven, and I was shown the ark of God covered with the mercy seat. Two angels stood, one at each end of the ark, with their wings spread over the mercy seat, and their faces turned toward it. My accompanying angel informed me that these represented all the heavenly host looking with reverential awe toward the holy law which had been written by the finger of God. Jesus raised the cover of the ark, and I beheld the tables of stone on which the Ten Commandments were written. I was amazed as I saw the fourth commandment in the very center of the ten precepts, with a soft halo of light encircling it. Said the angel: "It is the only one of the ten which defines the living God who created the heavens and the earth and all things that are therein. When the foundations of the earth were laid, then was laid the foundation of the Sabbath also." I was shown that if the true Sabbath had always been kept, there would never have been an infidel or an atheist. The observance of the Sabbath would have preserved the world from idolatry. The fourth commandment has been trampled upon; therefore we are called upon to repair the breach in the law, and plead for the downtrodden Sabbath. The man of sin, who exalted himself above God, and thought to change times and laws, brought about the change of the Sabbath from the seventh to the first day of the week. In doing this, he made a breach in the law of God. Just prior to the great day of God, a message is sent forth to warn the people to come back to their allegiance to the law of God which antichrist has broken down. By precept and example, attention must be called to the breach in the law. I was shown that the third angel, proclaiming the commandments of God and the faith of Jesus, represents the people who receive this message and raise the voice of warning to the world, to keep the commandments of God as the apple of the eye, and that in response to this warning many would embrace the Sabbath of the Lord. When we received the light upon the fourth commandment, there were about twenty-five Adventists in Maine who observed the Sabbath; but these were so diverse in sentiment upon other points of doctrine, and so scattered in location, that their influence was very small. There was about the same number, in similar condition, in other parts of New England. It seemed to be our duty to visit these frequently at their homes, and strengthen them in the Lord and in His truth, and as they were so much scattered, it was necessary for us to be on the road much of the time. For want of means we took the cheapest private conveyance, second-class cars, and lower-deck passage on steamers. In my feeble condition I found traveling by private conveyance most comfortable. When on second-class cars, we were usually enveloped in tobacco smoke, from the effects of which I often fainted. When on steamers, on lower deck, we suffered the same from the smoke of tobacco, besides the swearing and vulgar conversation of the ship hands and the baser portion of the traveling public. At night we lay down to sleep on the hard floor, dry goods boxes, or sacks of grain, with carpetbags for pillows, and overcoats and shawls for covering. If suffering from the winter's cold, we would walk the deck to keep warm. When oppressed by the heat of summer, we would go upon the upper deck to secure the cool night air. This was fatiguing to me, especially when traveling with an infant in my arms. This manner of life was by no means one of our choosing. God called us in our poverty, and led us through the furnace of affliction, to give us an experience which should be of great worth to us, and an example to others who should afterward join us in labor. Our Master was a man of sorrows; He was acquainted with grief; and those who suffer with Him will reign with Him. When the Lord appeared to Saul in his conversion, He did not purpose to show him how much good he should enjoy, but what great things he should suffer for His name. Suffering has been the portion of the people of God from the days of the martyr Abel. The patriarchs suffered for being true to God and obedient to His commandments. The great Head of the church suffered for our sake; His first apostles and the primitive church suffered; the millions of martyrs suffered, and the Reformers suffered. And why should we, who have the blessed hope of immortality, to be consummated at the soon appearing of Christ, shrink from a life of suffering? Were it possible to reach the tree of life in the midst of the Paradise of God without suffering, we would not enjoy so rich a reward for which we had not suffered. We would shrink back from the glory; shame would seize us in the presence of those who had fought the good fight, had run the race with patience, and had laid hold on eternal life. But none will be there who have not, like Moses, chosen to suffer affliction with the people of God. The prophet John saw the multitude of the redeemed, and inquired who they were. The prompt answer came: "These are they which came out of great tribulation, and have washed their robes, and made them white in the blood of the Lamb." When we began to present the light on the Sabbath question, we had no clearly defined idea of the third angel's message of Revelation 14:9-12. The burden of our testimony as we came before the people was that the great second advent movement was of God, that the first and second messages had gone forth, and that the third was to be given. We saw that the third message closed with the words: "Here is the patience of the saints: here are they that keep the commandments of God, and the faith of Jesus." And we as clearly saw as we now see that these prophetic words suggested a Sabbath reform; but as to what the worship of the beast mentioned in the message was, or what the image and the mark of the beast were, we had no defined position. God by His Holy Spirit let light shine forth upon His servants, and the subject gradually opened to their minds. It required much study and anxious care to search it out, link after link. By care, anxiety, and incessant labor has the work moved on until the great truths of our message, a clear, connected, perfect whole, have been given to the world.